Time to end my summer-break with a review that just wants to be written. Especially if you look at my last post. Lets indulge in some dieselpunk goodness with Destiny’s Wing! 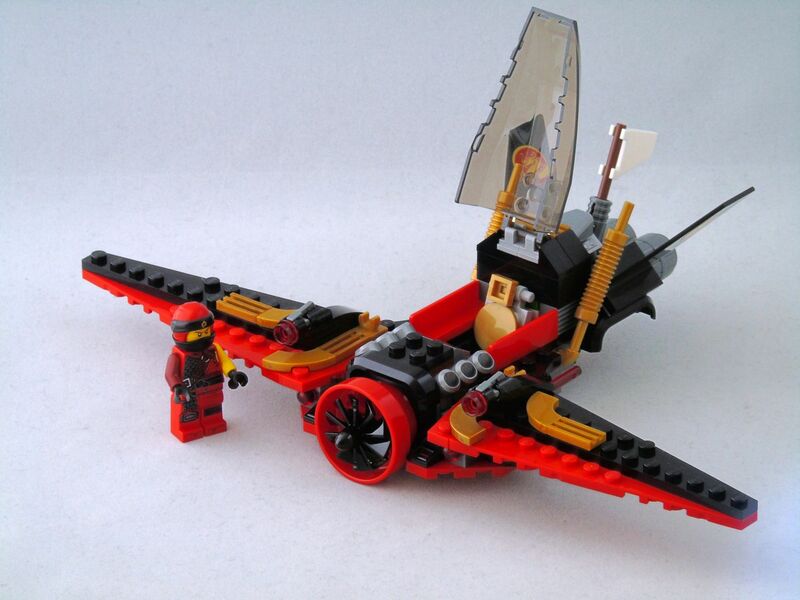 Jet Jack and Kai, with the Dragonbone blade and Destiny’s Wing. 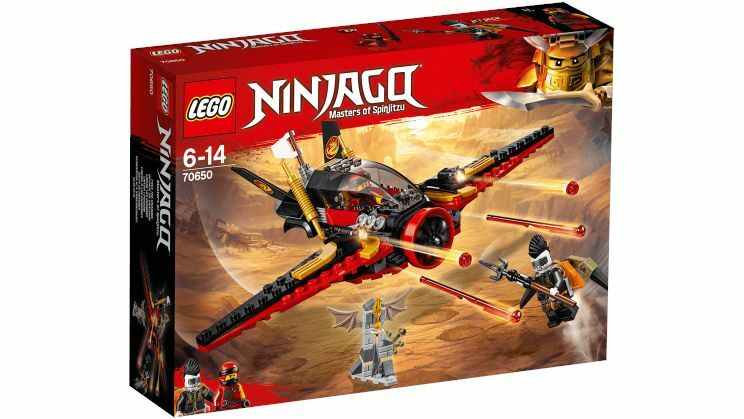 While I am not really interested and the Ninjago TV series, or know much about it beyond the basics, and the media buzz around film not leaving much an impression on me either, I find the sets quite often really appealing. 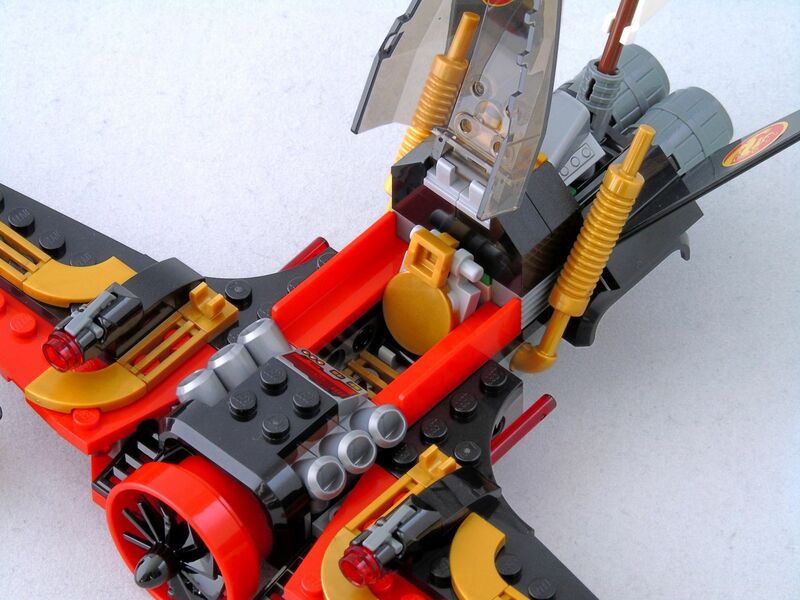 They are amongst the most creative of the current Lego themes. Without the constraints of licensed-IPs – and often with a charming mix of styles! This year’s sub-theme, running under the title Free The Dragons is no different. The Ninjago-typical far eastern base recipe (including dragons of course!) gets some post-apocalyptic flavours thrown in, with with a healthy dose of retro-futurism, like the 2016 Skybound-had, mixed in for good measure. This style-cocktail works very well and since I like the steampunk Air Pirate-theme of Skybound dearly, I am quite happy we get more from that general direction. And indeed, Destiny’s Wing could have been just as well a set from that theme as well. 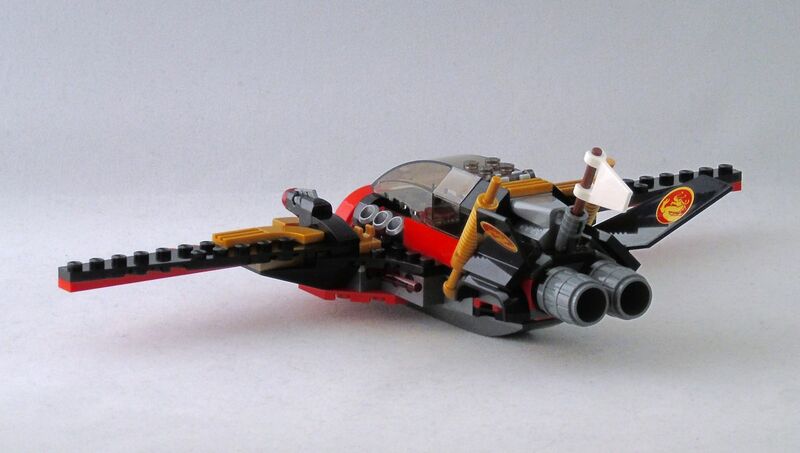 The namesake main build, an airplane in the flying-wing-style, some quite obvious design-features with Flintlocke’s Sky Shark, like the grey barrel jet engines on the rear and the hot-rod-style exhaust pipes. Destiny’s Wing is the more stylish of the two though. A bolder, more unconventional design, that immediately drew my attention to it when the first pictures of the set appeared a couple months ago. And what can I say: it just works! Destiny’s Wing is also the slightly more robust build, partly because its overall more compact with no pieces that are just clipped-on (and Sky Shark had plenty of that! ), partly because of its more conventional armament. Instead of the pirate treasure-chest bomb bays, which are opened by a sliding mechanism (a bit of a funky construction, but quite nicely working, if a bit flimsy), Destiny’s Wing features the good old spring-loaded missile and stud shooter-combination. Probably the most simple approach you can get, but also a very effective and reliable one. If you are a regular reader you might also know my dislike of stickers. I much prefer prints or even brick-build ornamentation instead. I am therefore glad to say that the sticker-situation in this set is on the acceptable side, with two identical 2×2-sized stickers on each of the tail fins. Ok, the positioning might be a bit tricky to get right, but they are of a decent size and really help its look. Btw. The cockpit-controls consist of a 1×2 wedge tile. Printed. As it should be. …and jet propulsion. But as long as it works, I don’t complain! Destiny’s Wing has decently-sized cockpit with a quite elaborate pilot’s seat. I especially like the headrest, which is a nice detail. Additional to the main build, we also get a little shrine holding a Dragonbone Blade. A cute little build that looks like it could have jumped right out of Skyrim. Very nice. Same applies to the sword itself. Both hilt and blade are very well sculpted, and the dual moulding on the blade gives it an appropriate, semi-organic-look. 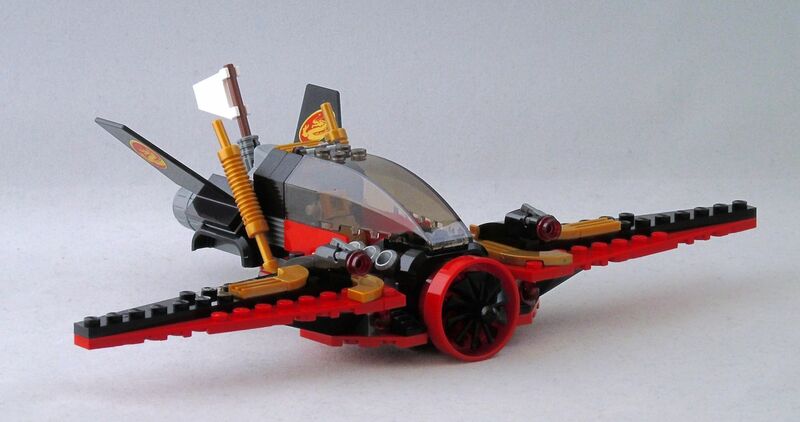 Very nice and a welcome departure from the at the same time overbuilt and too simplistic Djinn Blades. If they were just 50% bit smaller! Once again the Minifigures get dwarfed by these giant sword designs. It might work well for an Orc army or trolls (certainly better than the old-style swords), but it always gives me a hard time to see these swords worn by a normal Minifigure. Please meet Jet Jack, Dragonbone Blade and Kai. Speaking of those, Destiny’s Wing features Kai in a really nicely printed medieval-stye outfit with scale armor and two-piece headdress and two katanas and Jet Jack, probably one of the most edgy female Minifigures Lego has ever done: with her mohawk and warpaint she is really a show. Very post-apocalyptic. She could really be the sister of Furiosa from Mad Max: Fury Road. She is armed with a spear with a Ninja-Dagger (aka sai) as tip. Nicely done. She also has a little brick-build jet pack (probably to justify her name). Not a revolutionary build, but quite neat. All in all, Destiny’s Wing is an excellent little set. The builds are great, the Minifigures well designed and detailed and the new Dragon Bone Blade pieces are simply beautiful with a lot of potential for further use.